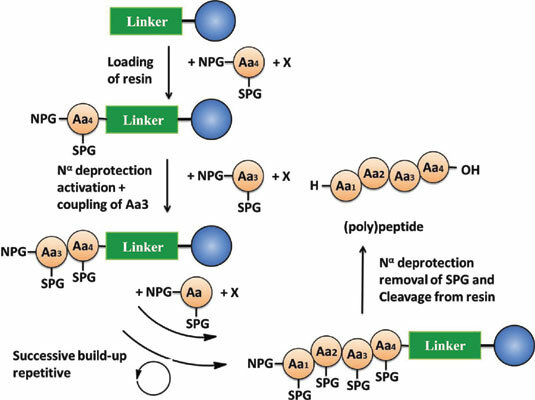 Rapid developments in protein engineering, immunology and pharmaceutical research have led to immense demands for synthetic polypeptides. Several polypeptides synthesizing strategies are now available, among which solid-phase synthesis and solution- phase synthesis are especially relevant. This review pretended to compare these two synthesizing strategies with no bias, appreciate their advantages, drawbacks and limitations, and forecast their developmental trends. It also introduced several other special synthetic strategies, and their applications were presented in detail. Peptide, oligopeptide, synthetic peptide, solid phase synthesis, solution phase synthesis, microwave-assisted.